CNG: Printed Auction Triton XI. BYZACIUM, Hadrumentum. Augustus. 27 BC-AD 14. Æ “Dupondius” (27mm, 12.01 g, 3h). Fabius Africanus, proconsul. Struck 6-5 BC. Sale: Triton XI, Lot: 560. Estimate $2000. Sold For $3000. This amount does not include the buyer’s fee. BYZACIUM, Hadrumentum. Augustus. 27 BC-AD 14. Æ “Dupondius” (27mm, 12.01 g, 3h). Fabius Africanus, proconsul. Struck 6-5 BC. 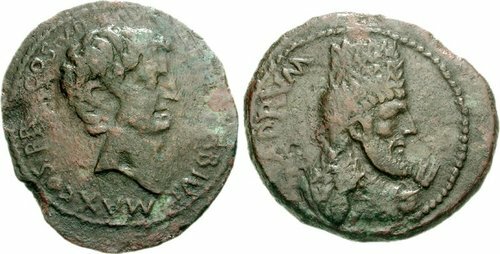 AFR[IC] FABIVS MAX COS PR[O]COS VII [E]PVL, bare head of Fabius Maximus Africanus right / [H]ADRVM, draped bust of Baal right, wearing tiara, raising right hand and holding two grain ears in left. RPC I 780; MAA 91; Müller, Afrique 29; SNG Copenhagen 64-5. VF, brown patina with areas of red, minor smoothing. Extremely rare.